Read on to learn more about our programs and upcoming events. For more information or to activate your account click here. Select UC San Diego as your institution to register for free. If you are a Department Chair and want to learn how to maximize the benefits of NCFDD membership to build a stronger and more productive department, check out these tips. NCFDD’s Faculty Success Program is a 12-week virtual boot camp for faculty who want to learn how to increase their research productivity, get control of their time, and live a full and healthy life beyond campus. The program is designed for tenure-track and tenured faculty. It combines NCFDD’s core curriculum, intense accountability, coaching, and peer support for personal and professional transformation. For additional information and upcoming session dates, visit https://www.facultydiversity.org/fsp-bootcamp. The Center for Faculty Diversity and Inclusion provides financial support to faculty who wish to participate in the program through a competitive application process. We are currently accepting applications for sponsored participation in the Summer Faculty Success Program. Please submit your application to vcedi-faculty@ucsd.edu by June 9, 2019. All Academic Senate and Non-Senate Instructional faculty at UC San Diego with expectations for scholarly research, teaching, and service are eligible to apply. Faculty who do not want to compete for financial assistance and are willing to pay independently may contact vcedi-faculty@ucsd.edu to be included in priority registration. The Networks meet quarterly and for special events, including the annual Faculty of Color Reception in the fall and the Women’s Faculty Reception in the winter. 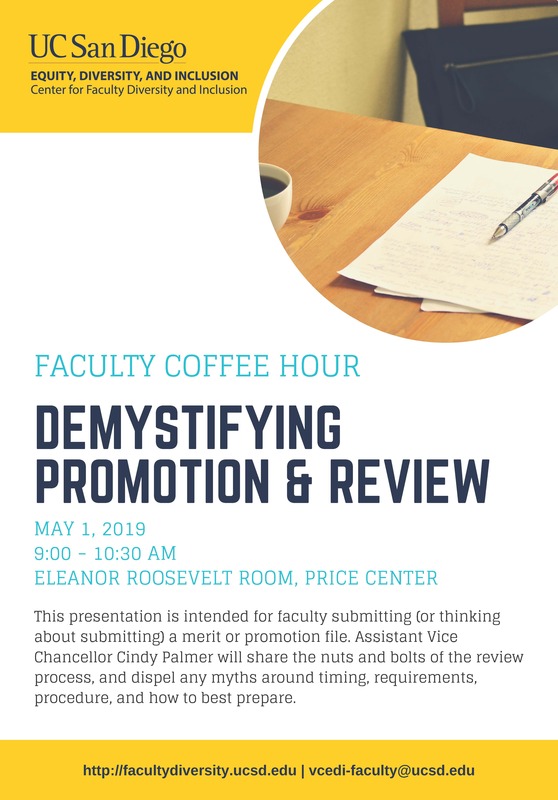 This presentation is intended for faculty going up (or thinking about going up) for review or promotion. We'll share the nuts and bolts of the review process, and dispel any myths around timing, requirements, procedure, and how to best prepare. 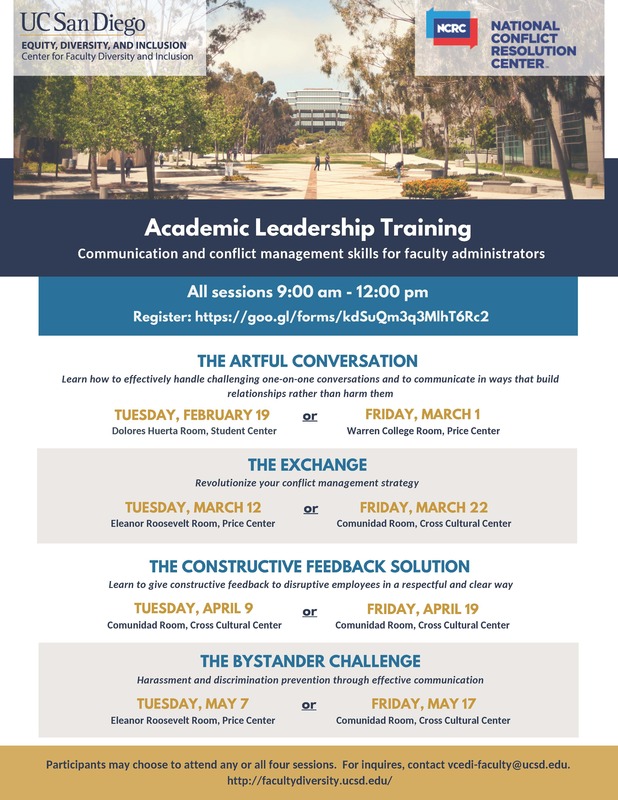 We have partnered with the National Conflict Resolution Center, a global leader in mediation training, to offer a four-part training on communication and conflict management skills for faculty administrators.These workshops are designed to improve your ability to effectively communicate, negotiate and manage conflict. Each workshop is three hours and will be offered twice to accommodate different schedules. We offer small grants ranging from $500 to $3,000 to support faculty who want to enhance their leadership capacity in support of diversity and equity. Grants may be used to cover the cost of participating in a workshop, conference, or other opportunity that will help faculty transform knowledge around diversity into strategic action. Allowable costs include registration fees, and any associated travel, accommodation, and meals. All Academic Senate Faculty and Non-Senate Instructional Faculty from General Campus, Health Sciences, and Scripps Institution of Oceanography are eligible to apply. What type of leadership development activities will be considered? Champion faculty diversity and equity in a thoughtful systems approach. Applicants are encouraged to think broadly in identifying opportunities that will help them develop as diversity leaders. The following examples are merely illustrative. Applications are accepted on a rolling basis and awarded based on eligibility and potential for impact, subject to the availability of funds. Description of Opportunity – Please describe the opportunity in which you seek to participate. Include website links, flyers, or other supporting documents. Rationale – Please describe what you hope to gain from your participation, and how it will increase your knowledge, skills, or ability to contribute to diversity. Note: professional conferences associated with an appointee’s discipline or any activity solely benefiting his/her research will not be considered for award. Budget – Include how much you are seeking (not to exceed $3,000) and an explanation of how the funds will be used. Please include specific cost estimates. For additional information, contact vcedi-faculty@ucsd.edu. Professional success in academia depends largely on our writing and productivity, yet we can struggle to find the time to write and stay on course with our publication goals. Jumpstart your summer writing goals or re-energize a research project! 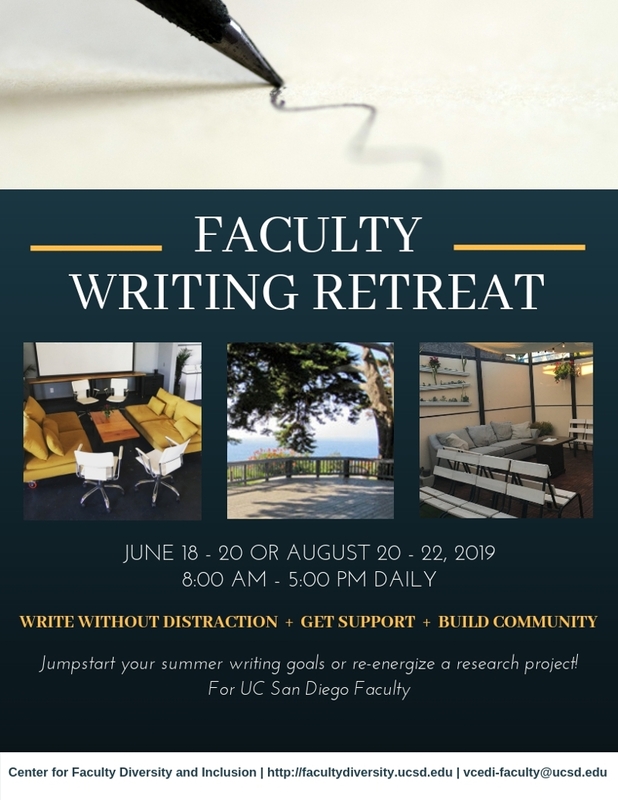 The writing retreat supports individual scholarship while building a community of diverse scholars and writers by providing a dedicated time and space to write without distraction. The retreat will primarily consist of unstructured writing time with some discussion and reflection each day. Submit application via Google forms at: https://forms.gle/rpzkeddD8z5MEQuv8 by April 24, 2019. Do you have an amazing idea that will help transform educational access? Are you organizing a cultural celebration on campus? EDI provides grants (up to $15,000) and co-sponsorships to faculty and staff who propose innovative programs and events that advance the goals of the EDI Office.